Keep me up-to-date on upcoming festivals and news! Thunderbird Artists respects your privacy. We will NEVER sell, rent or share your email address. That’s more than a policy, it’s our personal guarantee! Thunderbird Artists thanks each and every person who attended and participated in our fine art and wine events this past season! We truly appreciate your support of the arts and look forward to seeing you in the Fall!! Our fall and winter Calendar of Events (and applications) are now updated. The applications for our spring events will be available very soon. Come again for updates. Visit the Thunderbird Artists Gallery in downtown Carefree and view the showcased works of some of the finest artists in the country. 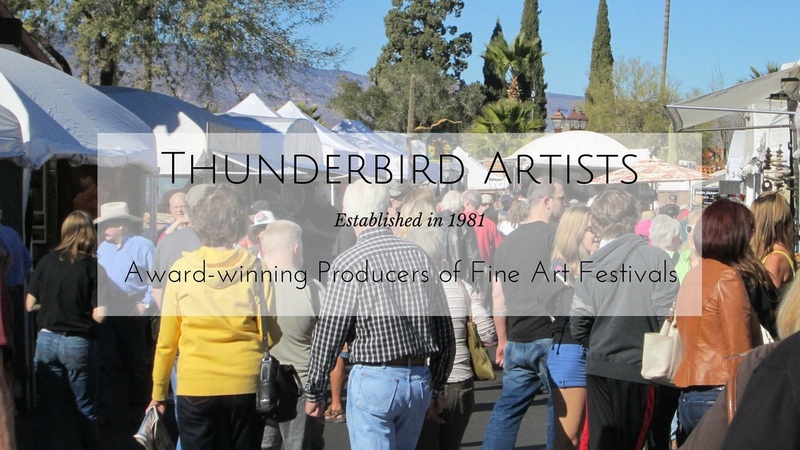 Thunderbird Artists is the leading producer of award-winning fine art and wine festivals in the Southwest. Our mission is to promote fine arts and fine crafts, while supporting the artists, local merchants and surrounding communities. Each festival is juried and includes unparalleled wine tasting and live musical entertainment, creating an ambiance like no other and ensuring a first-class experience for all who attend.